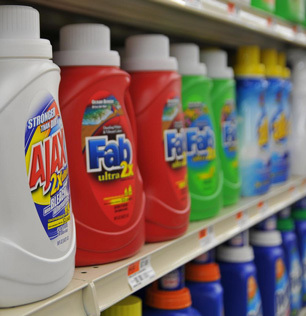 NTA can be found in some laundry detergents. Nitrilotriacetic Acid (NTA) is a chemical used in laundry detergent, as a scale prevention method for boilers, in photography, leather tanning, in textile and paper manufacturing, and as a medical treatment for manganese poisoning. Its use in detergents was banned in the 1970s, but resumed in the 1980s to replace phosphates that were then being banned. Nitrilotriacetic Acid is mildly toxic with acute exposure. Animal studies have shown long term effects including kidney damage, blood sugar changes and skeletal issues. It is also a potential human carcinogen, with the International Agency for Research on Cancer reporting “sufficient evidence” of carcinogenicity in animal tests. The EPA recommends activated carbon for the treatment of nitrilotriacetic acid.